Last July we highlighted 5 stocks that we believed could double cash flow over 5 years. Twelve months on we review how they have performed, and discuss the reasons for the one that disappointed. The cashflow criteria goes some way to explaining how we think about investing. As well as this though, we also require a margin of safety (valuation support) in determining whether stocks are suitable investments for the portfolio. Whilst we use the megatrend framework to identify the narrow subset of stocks that we then spend more time understanding, we ultimately invest capital on a stock by stock, bottom-up basis. We focus heavily on cash flow growth as a key metric of how we look to invest money. We also acknowledge the need to appropriately diversify the portfolio holdings from an industry perspective. We spend almost all of our time trying to find ideas where companies can generate cash flow growth, regardless of the macro backdrop we are faced with. Ultimately if a company can generate cash flow growth, the share price should reflect this. 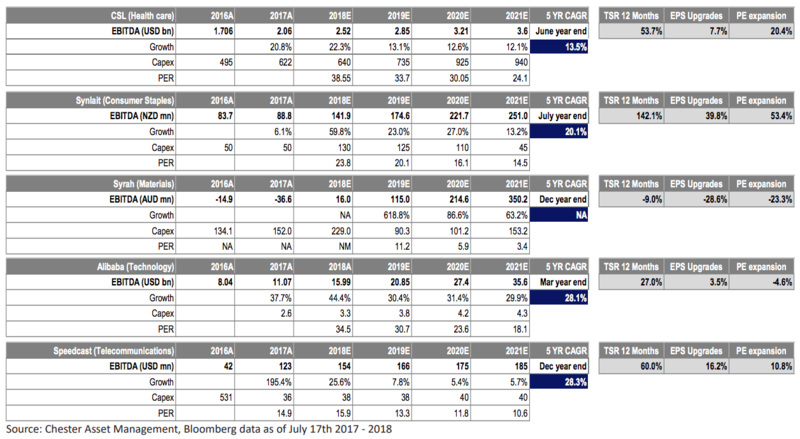 Revisiting the examples we illustrated last July shows the current EBITDA growth trajectory for each stock (used as an imperfect proxy for cash flow). How a company is selected for the portfolio then is a combination of the predictability of those cash flows, or on our belief the market is significantly discounting a company’s ability to generate those cash flows. Just as important as stock selection, is what is the capital (capex) required to generate that cash flow growth? Return of capital employed is a critical metric to assess a company’s ability to generate shareholder returns. We have also provided the last 12 months TSR (total shareholder returns including dividends), the change in earnings over the past 12 months and the change in the 12 month forward PE ratio. The chart is below, or you can access a larger version here. What this identifies is the strong returns most of these stocks generated (Synlait: +142%; Speedcast: +60%; CSL: +54%; Alibaba: +27%; Syrah: -9%), but also in aggregate the change in PE ratio. We could spend a significant amount of time dissecting why the PE ratios have increased, but in summary, it is a function of a strong bull market in growth stocks and reward for earnings momentum (companies upgrading earnings). We still hold these 5 stocks in the portfolio 12 months later, but at significantly lower portfolio weights than they were 12 months ago. The reason for this is relatively simple. We have less valuation support for these companies in aggregate than we did 12 months ago, hence our conviction level (portfolio weights) has changed with it. We will revisit this strategy in a future wire to nominate a further five stocks that have potential to double their cash flows over the next five years. The one stock in this sample that has been relatively disappointing has been Syrah Resources. There have been ongoing commissioning issues with their upstream plant at Balama, while progress appears to be slow on the downstream battery anode material (BAM) construction. It, unfortunately, remains one for the patient. We have been attracted to Syrah as the world’s largest graphite deposit, which will extract high quality graphite flake at (eventually) one of the lowest costs globally. Graphite is a structural beneficiary of the rise in Lithium Ion batteries used in electric vehicles where demand should rise 10 fold over the next 10 years. Our contention remains that combining this back drop with a drop in Chinese graphite production due to environmental permitting issues, will leave Syrah with an asset with global significance (35% of global graphite production) that we consider under valued given the reserve life. When investing in commodities, clearly there is less predictability around the cash flow profile, which needs to be traded off with strong valuation support. We tend to take a strategic long term view with such assets as predicting commodity pricing and quarterly production is near on impossible. Agree with your comments on Syrah and despite having issues during development and their early operational stage, they should nonetheless start paying dividends in the near term?